The OM-THA2 has been discontinued. Please see the OM-THA2-U as a possible alternative or contact our Data Acquisition Engineering department. The OM-THA2 is a multi-function unit that monitors temperature, relative humidity and dew point, provides for out-of-range conditions and continuously logs data. 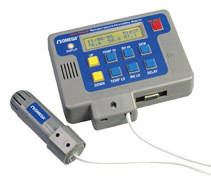 It consists of a base unit with an easy to read display and a 4.6 m (15') remote sensor probe. The alarm function monitors temperature, relative humidity and dew point once every second. If any of the readings reach an alarm threshold, the unit generates an alarm by turning on a beeper and a dry relay contact. The relay can be connected to a telephone dialer, light or bell. The delayed alarm feature can reduce false alarms by ignoring short duration alarm conditions. The unit will also generate an alarm on probe failure. The logger function records the temperature, relative humidity and dew point into internal non-volatile memory at a user specified interval. The recording is performed continuously after the unit is turned on. No computer setup is necessary to start logging, and all logging settings can be viewed or changed through the front panel functions. When the internal memory becomes full the recording rolls over, overwriting the oldest recorded data. Logged data can be reviewed on a computer using the included Windows software while continuously recording new data. All the operating settings of the OM-THA2 can be changed from the front panel, without the need for a computer. The two line display provides and easy to read means of viewing or changing settings. 참고: Model OM-THA2 includes complete operator’s manual, Windows software on CD ROM and ac adaptor.